Note: 64-bit version, and the Starter Edition, of Windows XP are not supported. WARNING! This utility is only for use with the Sony DSC-HX5V camera. Do not install this utility with any other model. WARNING! This Digital Camera firmware update and any changes incurred by it are permanent. It is not possible to return to a previous firmware version after updating the firmware. By continuing this update process and downloading and updating the firmware, you acknowledge that you are aware of this, and understand that this update cannot be reversed. WARNING! Do not remove the battery or disconnect the AC adaptor during the update. Doing so may cause the camera to become inoperable and require service. Download the DSCHX5V2.exe file to a temporary or download directory (please note this directory for reference). Go to the directory where the file was downloaded and double-click the DSCHX5V2.exe file to begin the installation. Make sure the USB connection is set to "Mass Storage". 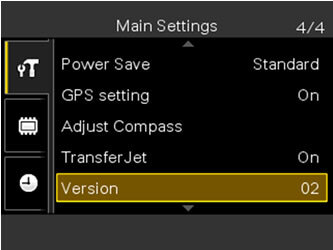 At the menu, select (Settings), then select (Main Settings), and then select "USB Connect". Select "Mass Storage", and then press the center of the control button. 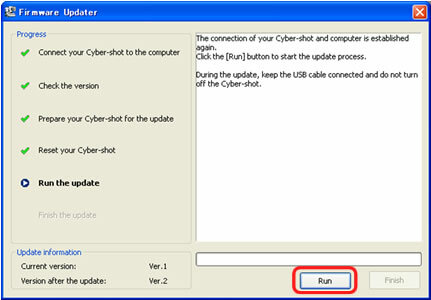 When the "Firmware Updater" screen is displayed on the computer, connect the camera to the computer with the supplied USB cable. Note: When the camera is connected to the computer the LCD screen on the camera turns off. Confirm that the "Safely Remove Hardware" icon is displayed in the task tray at the lower right hand corner of the computer screen. 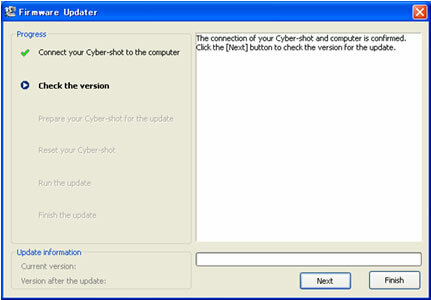 The connection confirmation screen is displayed on the computer and the LCD screen on the camera displays, "Follow the instructions on the PC". WARNING! Do not power off the camera or the computer, or disconnect, the camera from the computer until the firmware update is complete. 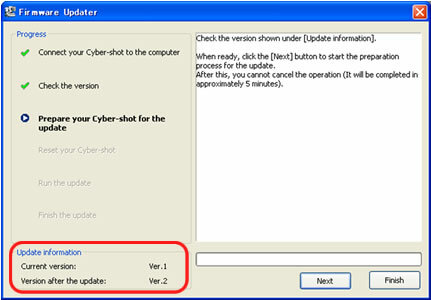 The "Update Information" is displayed at the lower left corner of the "Firmware Updater" screen. Confirm that the "Current version:" is "Ver.1", and that the "Version after the update:" is "Ver.2". Note: If the "Current version:" is "Ver.2", the update is not required. Follow these steps to discontinue the update process. In the task tray at the lower right hand corner of the computer screen, click the "Safely Remove Hardware" icon and stop the USB connection. Power off the camera and remove the battery pack or disconnect the AC adaptor. Replace the battery pack or reconnect the AC adaptor, and power the camera on. Note: The progress bar appears while the update is in progress. When the message, "The update process has been completed." is displayed, click "Finish". If the version number is 02, the camera firmware was successfully updated..